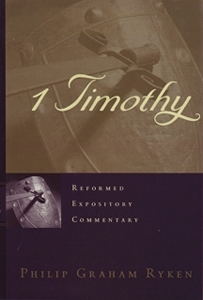 Posted by heldveld in 1 Timothy, Book Reviews, Philip Ryken, Reformed Expository Commentary. This is the second of the Reformed Expository Commentary series that I have read (see my review of James). As with the first I found this volume to be engaging and insightful. It definitely has deepened my knowledge of 1 Timothy. 1 Timothy is a pastoral epistle written primarily to young pastor Timothy, but Ryken shows from several passages that the letter was intended for the entire church. So even though many of the chapters would find direct application to pastors, elders and deacons all church members can learn for the requirements of these offices. Further 1 Timothy is very practical book making it easy to make direct applications to the Christian life. To this point Ryken’s commentary draws out many important points on subjects such as prayer and money. We are also reminded of or need to care for the poor and our pastors . While practical application of the Christian faith is predominate the book still instills the beautiful gospel message. Chapter 2 ‘Mercy for the Worst of Sinners’ which covers 1:12-16 is very touching. It is a great assurance to the Christian that God in his love has mercy on the worst of sinners. Although most of us have a hard time seeing the apostle Paul as the chief of sinners his words certain show his understanding of total depravity. This is truley good news to us all. I have to admit I may have been close to shedding a tear after reading this one. It was that moving. I Timothy also lays out a good deal of Christian doctrine. First in showing us that salvation in Christ is what should be first and foremost. It also expounds on the proper use of the law through three basic principles; 1 to show sin 2. to restrain evil and 3. to show the Christian way of life. Perhaps most importantly we are seen that we must hold to the orthodox faith. There were a couple of times I did question what the author was saying. First I’m not sure I agree with is Ryken’s promotion of the office of deaconess. Though I will admit I have not researched the issue deep enough to say definitively ‘I disagree’, my leaning is to disagree. At one point he makes reference to the ‘age of dinosours’ so I’m not sure if he holds to a non-24 hour interpretation of the creation days. Not that crucial to an understanding of I Timothy, but I’ll admit I lean strongly to the 6/24 view.